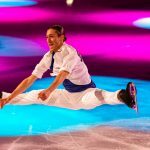 PITTSBURGH, PA AND CHICAGO, IL — Stars on Ice is celebrating the spirit of the Olympic Games with a 22-city tour across the U.S. The cast features Olympians from the 2014 Sochi Olympics and the recent Olympics held in PyeongChang, South Korea. Figure Skaters Online attended three shows on this tour–Portland, Maine (April 15), Pittsburgh, PA (April 27), and Chicago, IL (April 29). Website administrator Gina Capellazzi and Team FSO writer Maura Sullivan Hill shared their thoughts about and reactions to this year’s tour from the latter two cities. After stops in Allentown and Hershey, the Stars on Ice tour made its final Pennsylvania stop by visiting the Steel City on April 27. Pittsburgh hasn’t been a stop on the show’s schedule since the 2014 Olympic season so there was much excitement among the young skaters from Pittsburgh and surrounding areas, and figure skating fans as they entered the PPG Painters Arena for the show. In honor of the recent Olympics in PyeongChang, South Korea, this year’s tour was aptly titled “Celebration” and contained video clips from each of the cast members about their favorite moments participating in the Olympics. What was special about this season’s tour is it gives fans the opportunity to see a cast full of Olympians perform many of their Olympic season programs. The show versions of the competition programs may include fewer technical elements, but it is still a treat for fans to see these programs live. Even though I had seen Nathan Chen‘s “Nemesis” short program twice in person this season (Skate America and U.S. Championships), I was still excited to see it again. Watching it this time around was different because I got lost in Nathan’s performance, especially his exquisite step sequence. It was something that I overlooked throughout the season, as like many, I was caught up focusing on Nathan’s quadruple jumps. “Nemesis” was the last program of the show before the cast finale and it was great to see Nathan really get into the choreography of the program and skate it without caring about marks and placement. Another real thrill for fans was getting to see Ashley Wagner‘s La La Land free skate. Because Ashley skated to her Moulin Rouge free skate for the Grand Prix season and didn’t debut this program until the U.S. Championships in San Jose in January, we really didn’t get to see the full potential of the program this season. The beauty and delicacy Ashley brought to this performance, along with a bit of playfulness and fun during the “Someone in the Crowd” section, was a delight to watch. This program really highlighted the greatness in Ashley’s skating, and had me personally wishing we had gotten to see more of this program on the competitive side this season. There was a lot of cheers and screams from fans inside the PPG Painters Arena for Jason Brown‘s “The Room Where It Happens” Hamilton program. Unlike his competitive program, Jason came out unrecognizable with a black cape over his head, but then quickly got into his Aaron Burr character, delivering an energetic performance and showing off his incredible flexibility including a huge split jump in the middle of the program. Another highlight was seeing Maia Shibutani and Alex Shibutani‘s “Fix You/Paradise” medley. The two combined what they say is their two favorite competitive programs–Coldplay’s “Fix You” from 2015-2016 season when they won their first U.S. title and the World silver medal, and “Paradise,” also by Coldplay, this season’s free dance with which they won two Olympic bronze medals. Of course, the crowd went crazy during the duo’s signature element, the twizzles, which were as sharp and in sync as they were at the PyeongChang Olympics. The other Olympic season programs performed were Madison Hubbell and Zachary Donohue‘s sultry free dance to “Across the Sky/Caught out in the Rain,” Bradie Tennell‘s magical “Cinderella” free skate, and Adam Rippon‘s “Let Me Think About It” short program which had fans dancing in their seats to the club-vibe program. Stars on Ice also allows the opportunity for fans to see new show programs choreographed exclusively for the tour. Given the limited schedule between Worlds and the start of the tour, many selected music and choreographed the programs themselves, like Nathan Chen’s “Back from the Edge” program [click here to read FSO’s recently published interview with him]. In addition to performing her “Body Language” program, choreographed by Christopher Dean, that she had skated earlier in the season, Mirai Nagasu debuted a new show program to “No Good Deed” from the ever-popular Broadway musical, Wicked. It was something different for Mirai, portraying the wicked witch of the west Elphaba, but the crowd, who seemed to be familiar with the hit musical, was definitely into it and you could hear some singing along. Fans of the hit movie The Greatest Showman were treated to two numbers from the soundtrack. Karen Chen skated a beautiful program to “Never Enough” by Loren Allred, which included her exquisite spiral. Bradie Tennell skated to the uplifting anthem “This is Me,” which was used for promotional commercials for the Olympics. 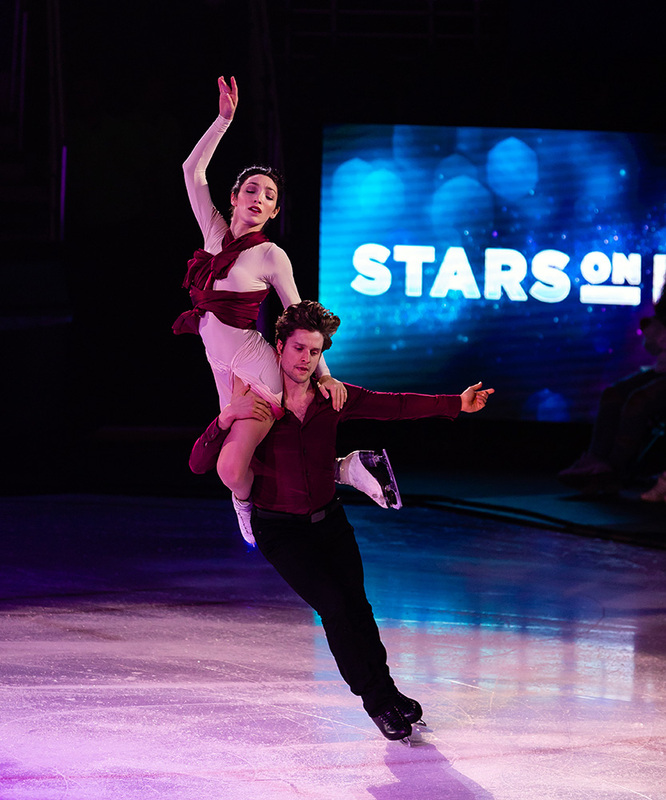 Meryl Davis and Charlie White showcased two different styles of programs. Their first, a medley of a cover of The Beatles’ “I Want to Hold Your Hand” and “Hold My Hand” by Jess Glynne, was a fun and lighthearted number that had the audience clapping along to the music. For their second number to Sia’s “Elastic Heart,” the 2014 Olympic champions used a long red scarf, which drew the audience in to the pure elegance and passion of the program. When it comes to the group numbers — the six men (Brown, Chen, Donohue, Rippon, Shibutani and White) skating to “Feel It Still” by Portugal. The Man was entertaining to say the least. I have particularly liked “the men only” group number in SOI over the years because it gets the guys out of their element and doing something contrary to what we are accustomed to seeing from them. The fun footwork throughout the program brought back memories of one of my favorite Stars on Ice programs–“The Walker” program from 2014 that featured White, Jeremy Abbott, Joshua Farris, Brent Bommentre, and Ryan Bradley. Another delightful group number was “The Shape of You” which featured Madison Hubbell and Zachary Donohue, Meryl Davis and Charlie White, and Ashley Wagner and Nathan Chen. While I enjoyed the performances of the two ice dance teams, the highlight of this group number for me was seeing Ashley and Nathan skating together. They both looked like they were truly enjoying themselves out there (and I was wishfully thinking it could be the start of a new partnership!). Personally, my favorite group number was the finale, where the skaters performed to “You Will Be Found” from the Broadway musical, Dear Evan Hansen. At the beginning of the number, the cast came out in black, skating to solemn lyrics like, “Have you ever felt like nobody was there? Have you ever felt forgotten in the middle of nowhere?” Then as videos of fans sharing why they love the Olympics and their favorite Olympic moments played on video screens in the corners of the rink, the cast re-emerged in all-white costumes as the music swelled into an uplifting score with lyrics like, “Even when the dark comes crashing through. When you need a friend to carry you. And when you’re broken on the ground. You will be found.” Watching the skaters together, I couldn’t help but think how every one of them out there on the ice likely could relate to this song in their own way. While their stories may be different, each has faced challenges during their respective careers. Yet, they have all managed to overcome them and reach individual milestones, and the finale of the show embodied their collective celebration. It was a hometown show for 2018 Olympic bronze medalist Bradie Tennell and 2014 Olympic bronze medalist Jason Brown at Chicago’s Allstate Arena on April 29, 2018. The skaters performed with freedom and enthusiasm, with all the pressures of the Olympic season lifted. Many performed versions of their Olympic programs, and video screens positioned at the corners of the rink displayed interviews with the cast sharing their favorite Olympic moments. Tennell skated an abbreviated version of her “Cinderella” Olympic long program, along with a number in the second half set to “This is Me” from the film, The Greatest Showman. During a t-shirt giveaway in the second half of the show, Brown announced that he had suffered an ankle injury at the previous night’s show in Detroit, but emphasized his excitement to perform in his hometown of Chicago, even at limited capacity. He performed his two programs without jumps and sat out the group numbers. Brown performed his short program to “The Room Where It Happens” from the Tony Award-winning musical Hamilton, including a new extended intro, wearing a black cape and playing the role of the ambitious Aaron Burr. When he shed the cape and transitioned into the start of the short program, the roar of the crowd was so loud it drowned out the start of the music. Ever the professional, Brown didn’t miss a beat and still delivered the program with his trademark energy, flexibility, and fast spins. Overall, the technical content in the show was strong, and the skaters didn’t hold back after a long season. All the ladies included multiple triple jumps and double axels in their programs, and 2018 World Champion Nathan Chen performed a quad toe in his program in the first act, set to “Back from the Edge” by James Arthur. 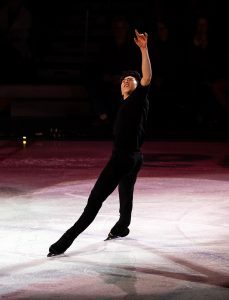 He also included three powerful, impressive triples when he performed “Nemesis,” his Olympic short program, to close out the solo performances in the show. The ice dancers also didn’t shy away from including difficult twizzle sequences: 2018 U.S. Champions Madison Hubbell and Zachary Donohue included their usual competitive twizzle sequence when they skated their Olympic free dance, and the 2018 Olympic Bronze Medalists Maia and Alex Shibutani performed their trademark fast twizzles sequences in both their programs. They brought back last year’s short dance, “That’s Life,” and also skated a medley of their 2016 “Fix You” free dance and this year’s “Paradise” free dance. 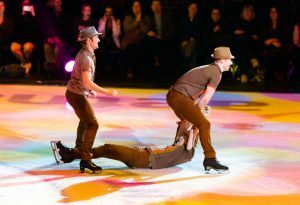 Stars on Ice is famous for its group numbers, and this year’s show did not disappoint. The girls number in the first half, “Dream,” featured beautiful spirals from the ladies of the tour: 2017 U.S. Champion Karen Chen, 2018 Olympic Team Bronze Medalist and 2008 U.S. Champion Mirai Nagasu, 2018 Olympic Team Bronze Medalist and 2018 U.S. National Champion Bradie Tennell, and three-time U.S. Champion and 2016 World Silver Medalist Ashley Wagner. The guys of the cast displayed quick, intricate footwork during their routine to “Feel It Still” by Portugal. The Man. They also made the crowd laugh during the backstage video intro to the program. While the rest of the group was pumping the crowd up via the selfie cam, the video cut to Adam Rippon, vigorously spraying hairspray on his fedora. “Adam, you’re wearing a hat, you don’t need hairspray!” Nathan Chen exclaimed, before the guys burst onto the ice for their impressive number. There was no shortage of laughs from Rippon for the crowd at Allstate Arena. The 2016 U.S. Men’s National Champion stood, encircled by his castmates, during the bridge portion of the opening number song and put his acting chops on display as he acted out P!nk’s exclamation about her glass being empty. While that comedy was choreographed, another humorous moment was unintentional. 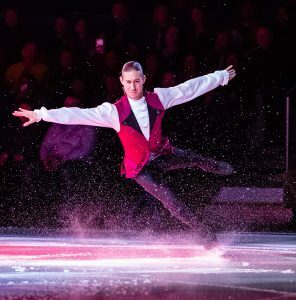 During his trio transition number with Maia and Alex Shibutani in the first half of the show, Rippon was slightly off position and out of his spotlight as the lyric, “One is the loneliest number” streamed over the speakers. He toe-tapped his way into the spotlight quickly, eliciting laughs from the crowd. Wagner performed a version of her free skate to the film soundtrack of La La Land, last seen at the U.S. Championships in San Jose, as well as another P!nk song, “I Am Here.” Both numbers emphasized her showmanship and artistry. With P!nk singing the lyric, “I’ve already seen the bottom, so there’s nothing to fear,” Wagner’s delivery was especially poignant in light of her difficult season. 2014 Olympic Ice Dance Champions Meryl Davis and Charlie White put their creativity on display in both of their programs. The first, a medley of a cover of The Beatles’ “I Want to Hold Your Hand” and “Hold My Hand” by Jess Glynne, included a costume change: from a 50s-esque letterman jacket on White and skirt on Davis to White shedding the jacket and Davis removing the skirt to reveal a more modern shorts ensemble. Their final number, to Sia’s “Elastic Heart,” used a red ribbon prop to great effect. At various points in the program, the fabric was wrapped around Davis, as if it were part of her dress, and then they seamlessly unwrapped it as part of the choreography and used the ribbon as a prop, a visual representation of an elastic heart. The cast closed the show with a group number set to “You Will Be Found” from the Tony Award-winning Broadway musical Dear Evan Hansen and the Chicago crowd was certainly happy to be found in the audience at Allstate Arena. They gave the performers a standing ovation at the end of the show.